Zenair Floats are given a designation number depending on their size. This designation number also corresponds to the flotation of the floats. For example, the #1450 floats are designed for use on aircraft with a MTOW of up to 1,450 pounds. 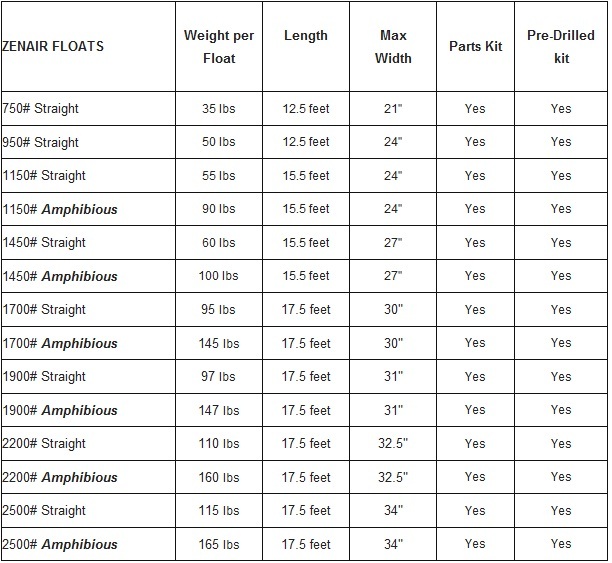 Note that the #1150 amphibious floats are more like 1250 floats and will work well on an aircraft with a MTOW of 1,250 lbs., however, they are too small for an LSA aircraft with a 1,420 pound gross on floats. Note: Factory-built ZENAIR floats are assembled with sealed blind rivets and marine adhesive in order to keep costs down and to simplify maintenance. For the larger floats, the extrusions are solid riveted as to maximize the strength. Kit customers assembling their own floats have a choice of assembling with the same sealed blind rivets; common aircraft solid-rivets can also be used instead. The standard hydraulic system includes a manual hand pump that is mounted close to the pilot. Pump used is a high quality Parker type with remote oil reservoir. An optional electric Parker pump is also available and can be mounted anywhere in the fuselage. Price for the manual or electric pump is the same.